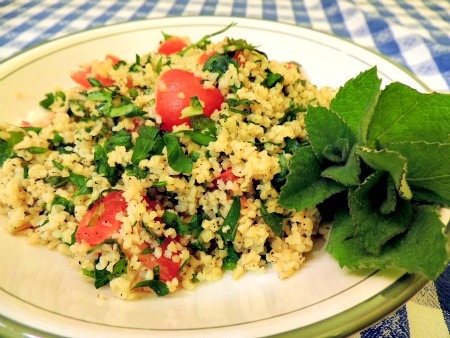 A traditional tabouli recipe is an elegant salad and my very favorite bulgur recipe. I'm sure it's even better if you can find fine bulgur. That's how it's made in Lebanon where it originated. Even with coarse bulgur that we buy here it's great. It's an easy raw food recipe. I love it because it tastes great, it's very light, low glycemic and it’s so easy to make. You don’t cook bulgur which makes it simple to prepare and gives it nice texture. Bulgur is basically precooked because it is steamed, dried and crushed before it's marketed. Because the grain is cracked open during the processing, it's very perishable so keep it refrigerated until you use it. There are different ways of preparing tabouli but it always features bulgur, lemon juice, olive oil and tomatoes. This tabouli recipe is very spicy and goes well with salads or steak or as a stand alone lunch entrée. It keeps very well and in fact gets better as the flavors blend. It’s great to make a big batch and then have it for your lunches or dinners the following week. Cover the bulgur with the water and let it stand until the water is absorbed and the bulgur is tender, about 15 minutes. If it doesn't absorb completely just drain it in strainer and go ahead with the other ingredients. The bulgur will soften as it soaks up all the liquids. Combine the bulgur, lemon juice and half the olive oil in a large bowl. Mix well and set it aside while you are preparing the rest of the vegetables. Add the mint, parsley, green onions, garlic, pepper, salt and the rest of the olive oil. Stir well and add the tomatoes and toss again. Now you can let it rest for 30 minutes or so to let all the flavors mingle together. You may want to adjust the seasonings and make it more or less garlicky or add more tomatoes and parsley. It's great with a vegetable dish or fish and a salad. This is a simple no cook recipe, easy to prepare, tasty and nutritious. It’s a wonderful way to eat more parsley which has so many nutrients and usually is only used as a garnish. This is a waste because parsley has a wonderful peppery flavor and adds so much spice to this bulgur recipe. Parsley is also high in vitamin C and folate. This tabouli recipe is super nutritious and it will also help to keep your blood sugar stable and promotes healthy elimination. It's insoluble fiber stays in the intestine soaking up water and moving food through your digestive system. Return from Tabouli Recipe to Low Glycemic Recipes. Return from Tabouli Recipe to Lifetime Fat Loss home page.